Huttonsville Correctional Center is a mixed custody prison that houses minimum to maximum security inmates. The facility is comprised of general population units, segregation inmates, a residential substance abuse treatment unit, and a community service unit. Currently this facility can house up to 1,140 offenders, making it the largest prison population in the state. Additionally, Huttonsville Correctional Center operates it's own intake and classification unit. 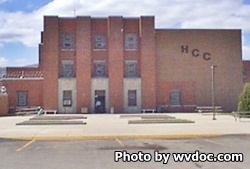 Huttonsville Correctional Center is also responsible for the operation of the Huttonsville Work Camp. The work camp is located next to the correctional center and houses 48 non-violent minimum custody offenders. Inmates at the work camp are allowed to work on road and highway crews, and assist in nearby community projects. Huttonsville Correctional Center participates in the Prison Industries program employing inmates in a furniture plant and in braille transcription. Inmates in the braille program transcribe textbooks into braille, offenders in the furniture plant build and refinish furniture used in various government agencies. Vocational classes offered to inmates at Huttonsville include auto mechanics and body repair, machining, electrical wiring, computers, carpentry, welding, and masonry. Other educational programs offered include adult basic education and GED classes. Visits at Huttonsville Correctional Center are conducted on Saturdays and Sundays from 8am-3:30pm. Processing of visitors ends at 2:30pm, if you arrive after this time you will not be admitted to visitation. All visitors must have an approved visitors application on file before they can attend a visiting session.